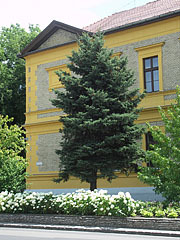 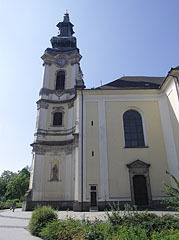 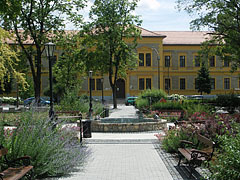 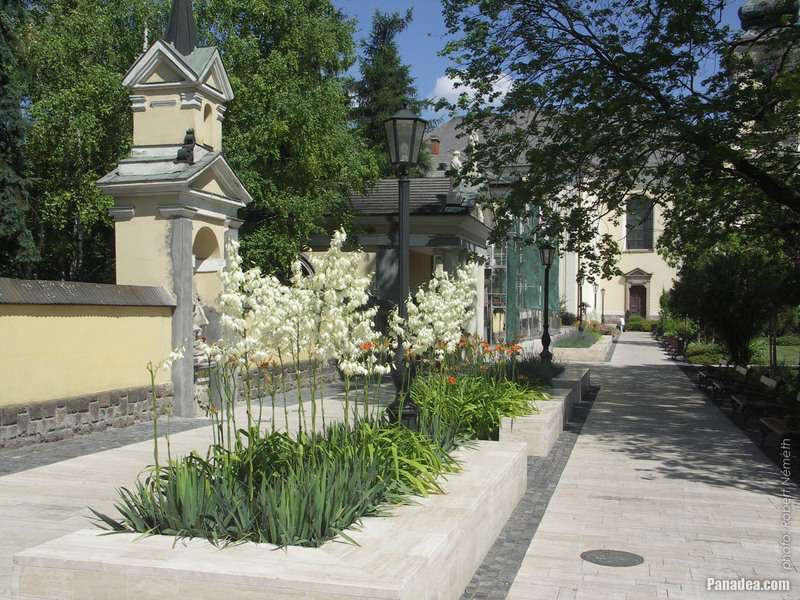 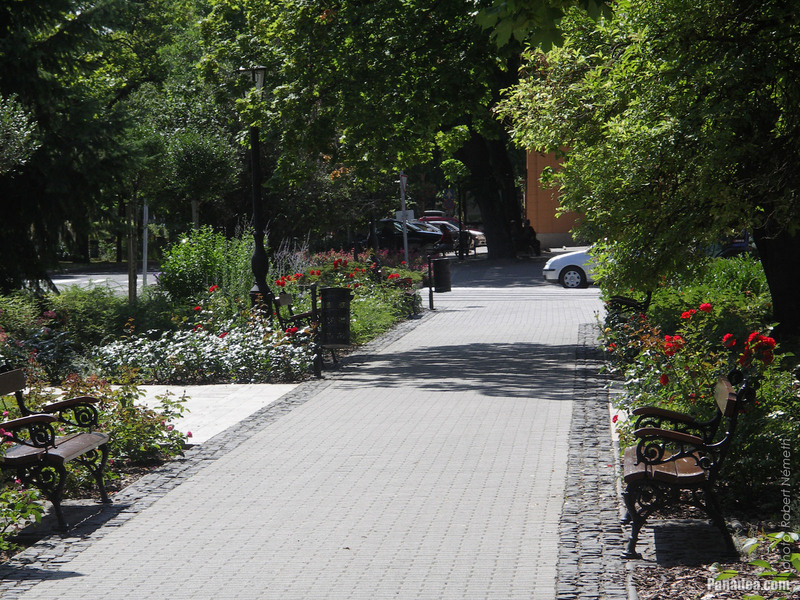 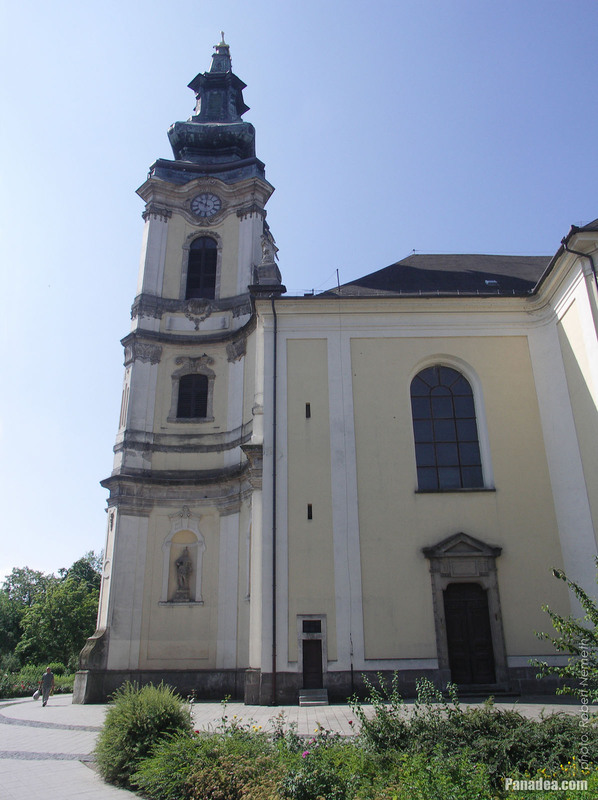 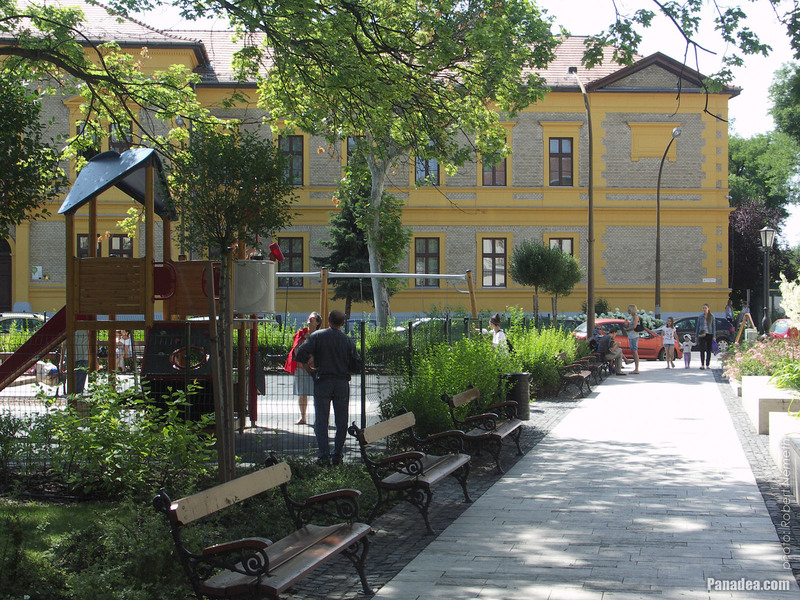 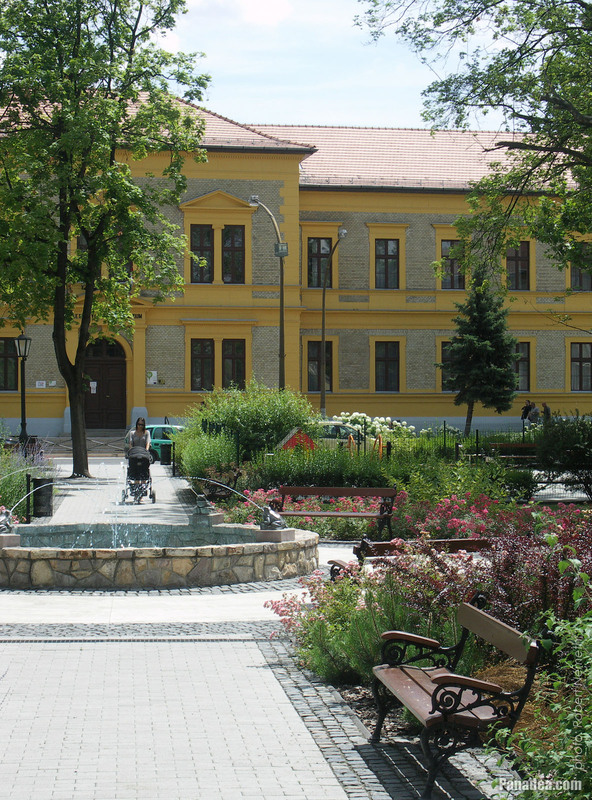 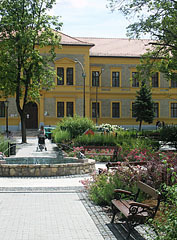 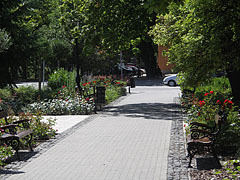 It was built by the plans of János Mayerhoffer between 1761-1782. 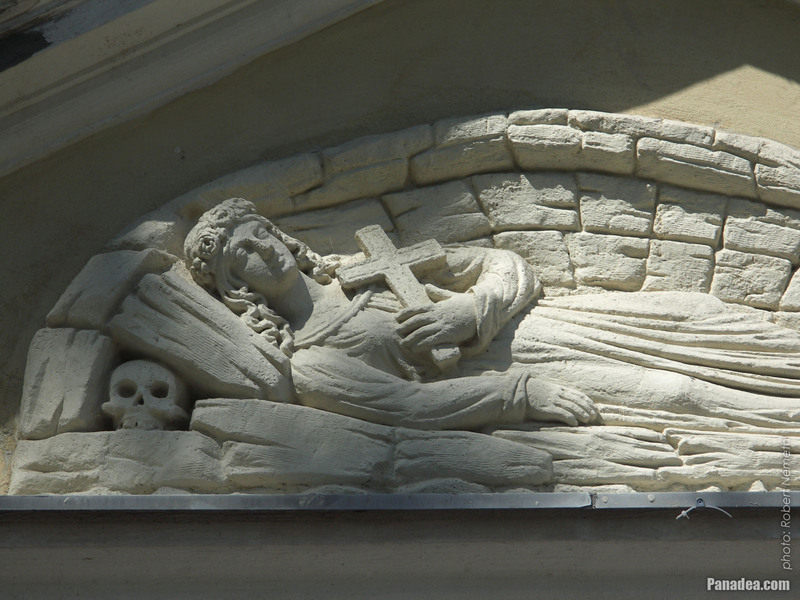 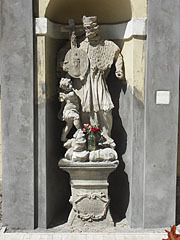 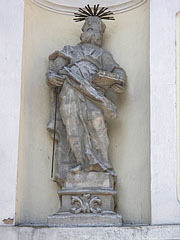 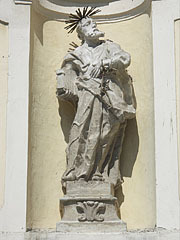 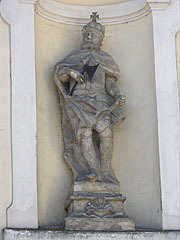 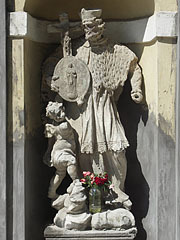 Sculpted by Lipót Antal Conti stonemason from Pest in 1761. 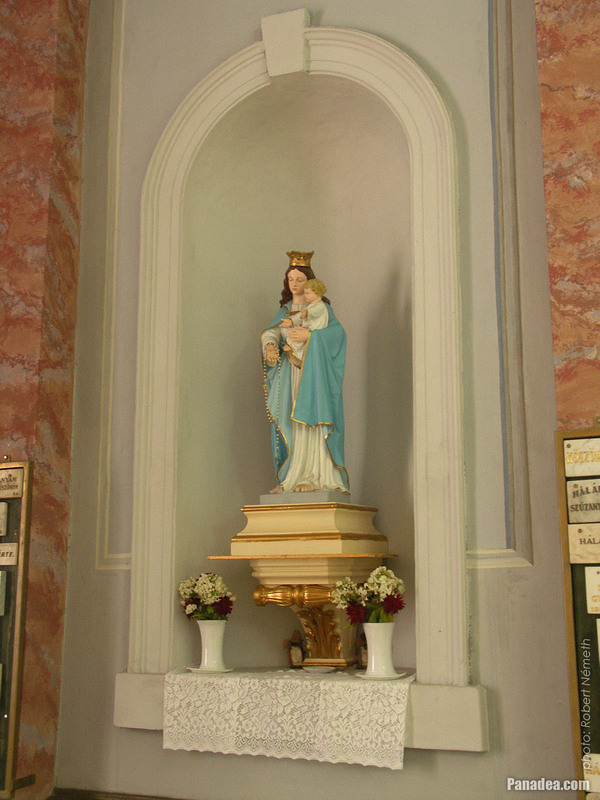 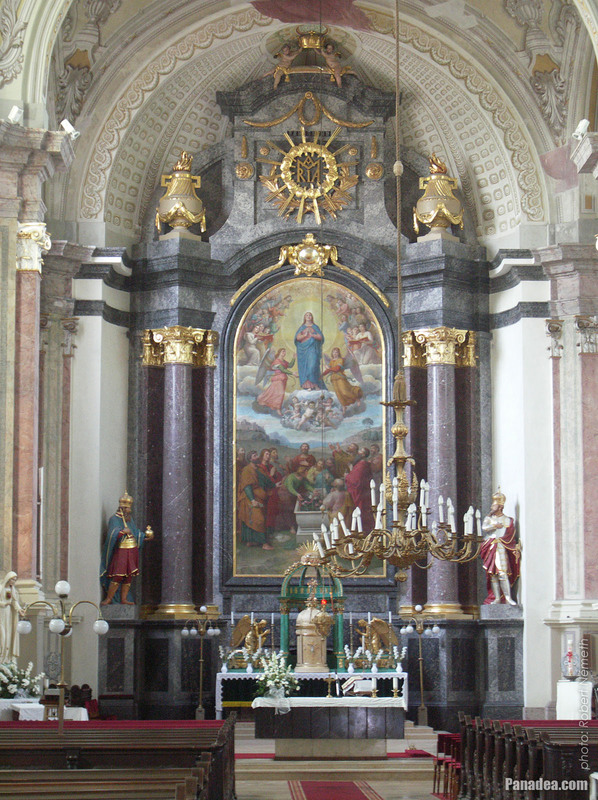 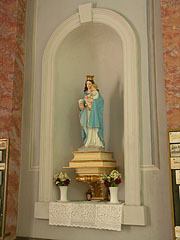 The main altar of the Assumption Main Parish Church with the altarpiece: "The Assumption of Virgin Mary"
Painted by Ferenc Soldatits in 1884 in Rome, Italy. The parish building was built between 1761-1763. 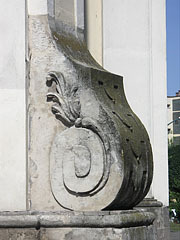 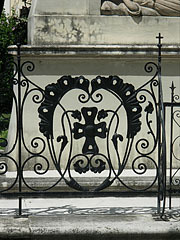 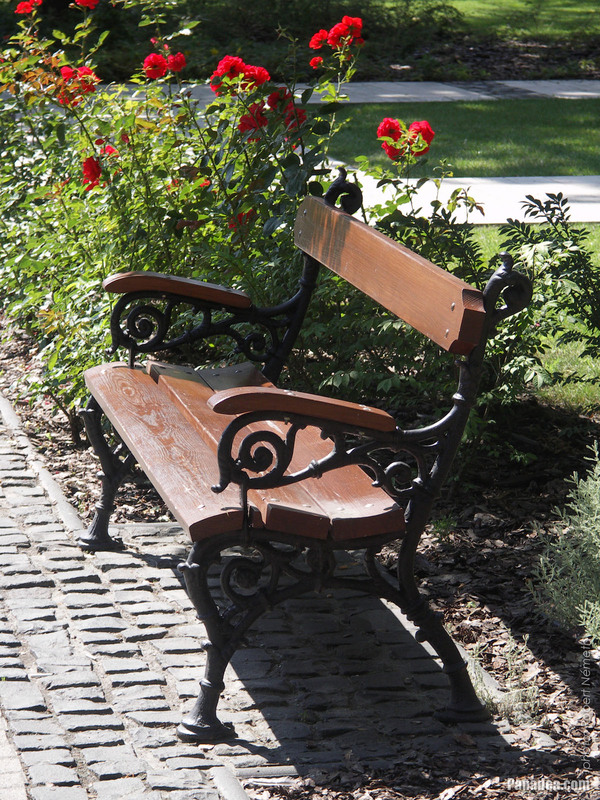 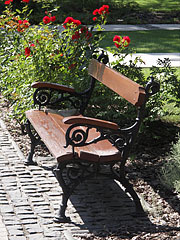 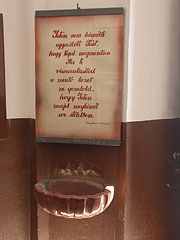 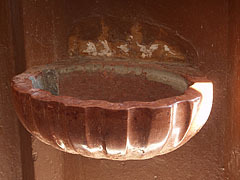 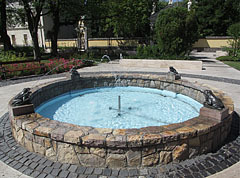 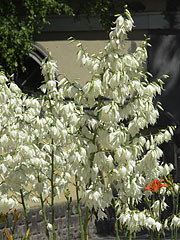 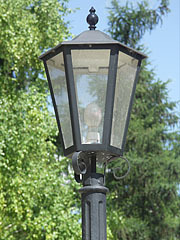 Created by Szigfrid Pongrácz and Vikor Vass in 1926. 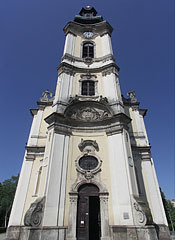 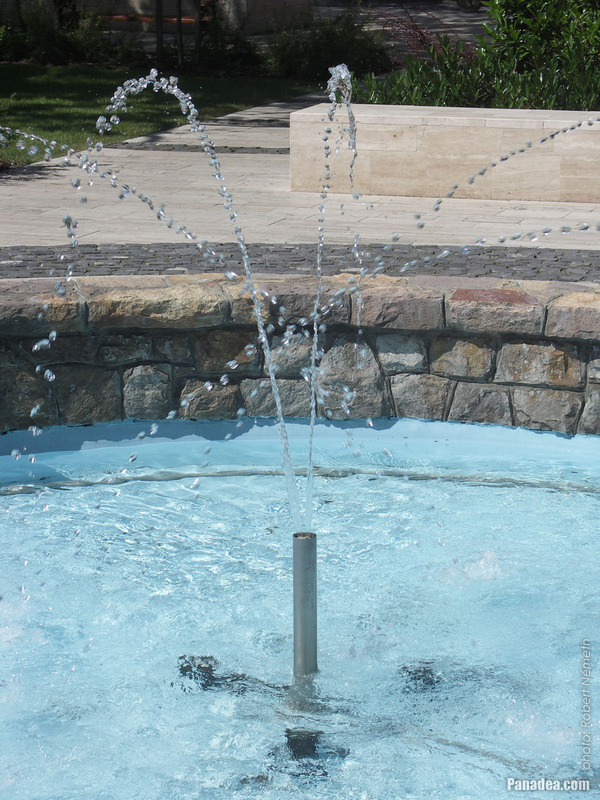 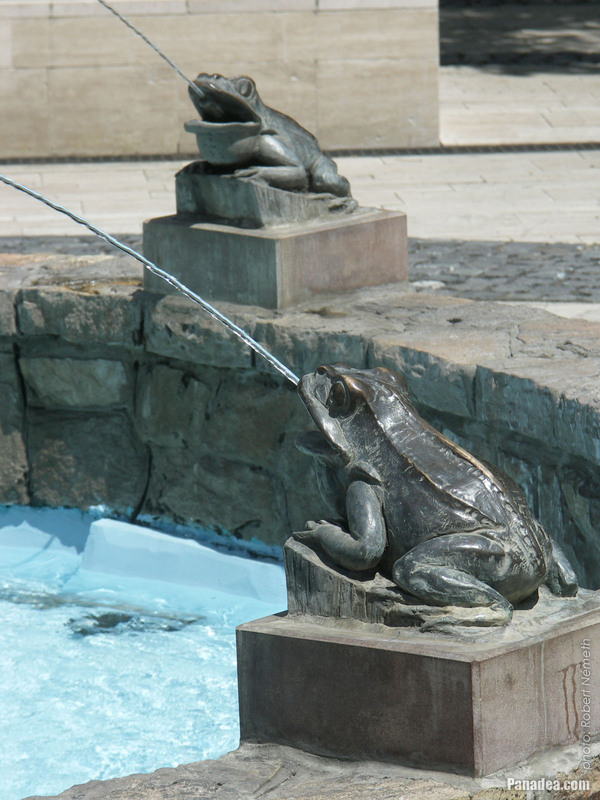 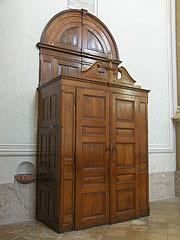 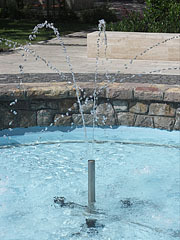 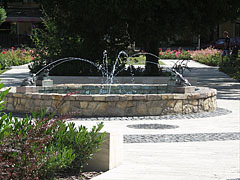 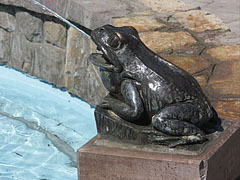 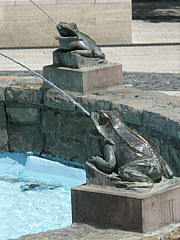 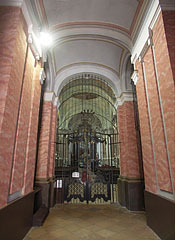 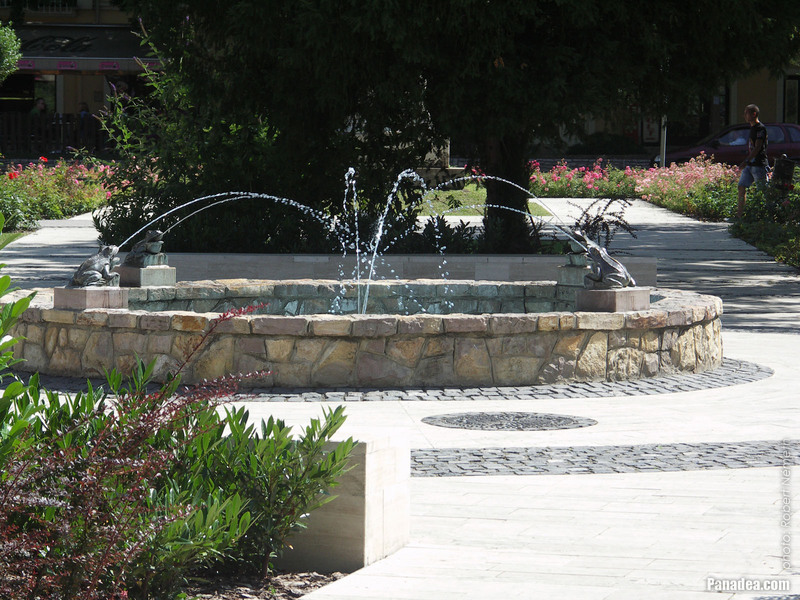 It was inaugurated in 2002, but due to vandalism it had to be renovated five years later, in 2007. 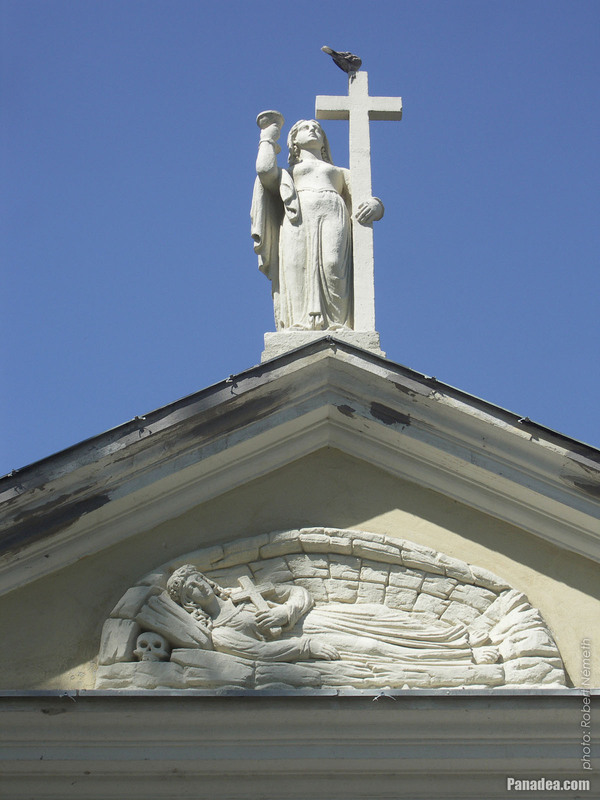 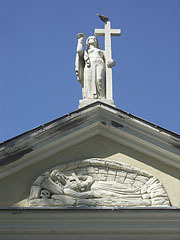 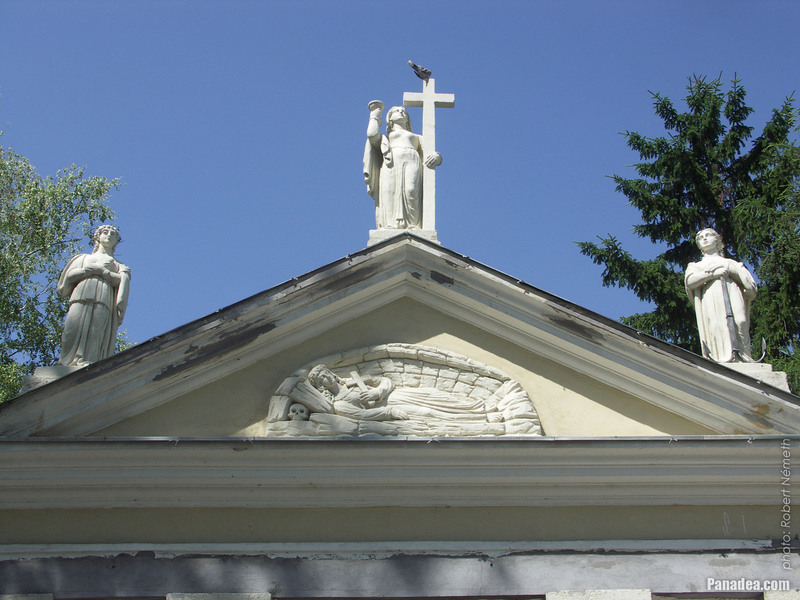 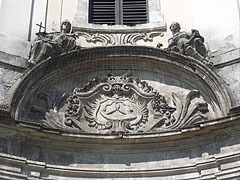 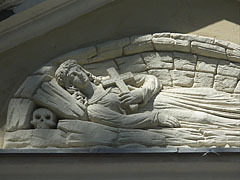 The embodying figures of the faith, the hope and the love, as well as the lying figure of Saint Rosalia in the tympanum. 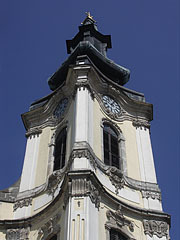 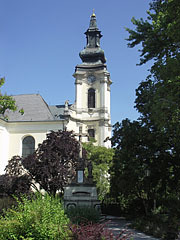 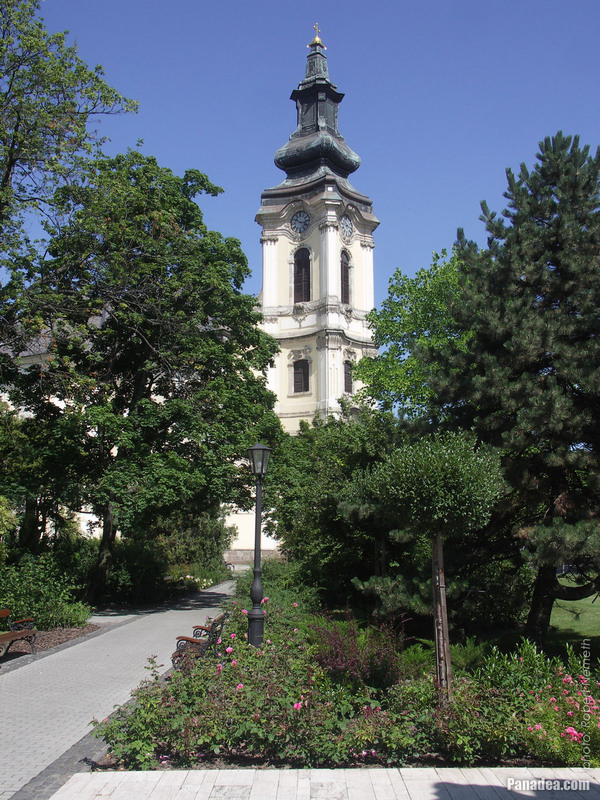 On 4 November 1956 the occupying Soviet troops shot and tore down the tower of the Roman Catholic Assumption of Mary Parish Church, including the Hungarian Holy Crown-shaped finial The incendiary bombs were fired from tanks. 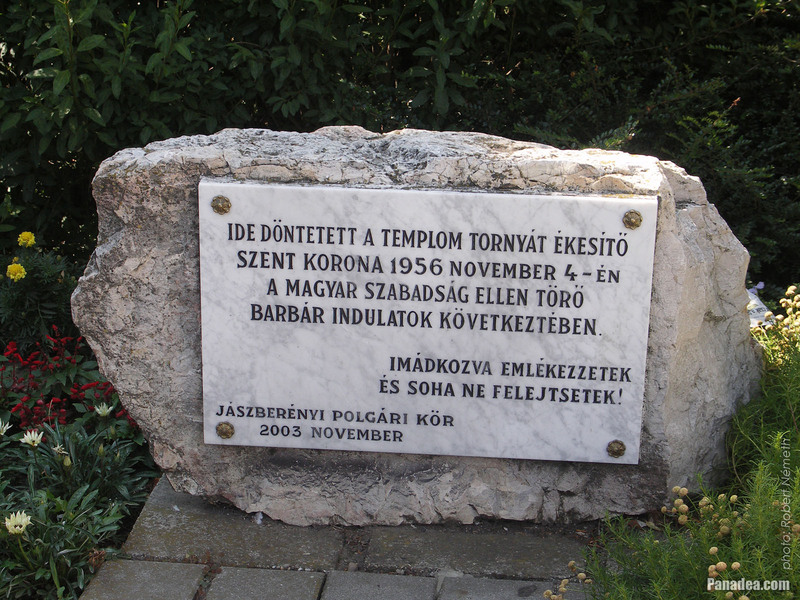 In addition, they also fired the passers-by with machine guns, the result was 8 dead and a lot of wounded civilians. 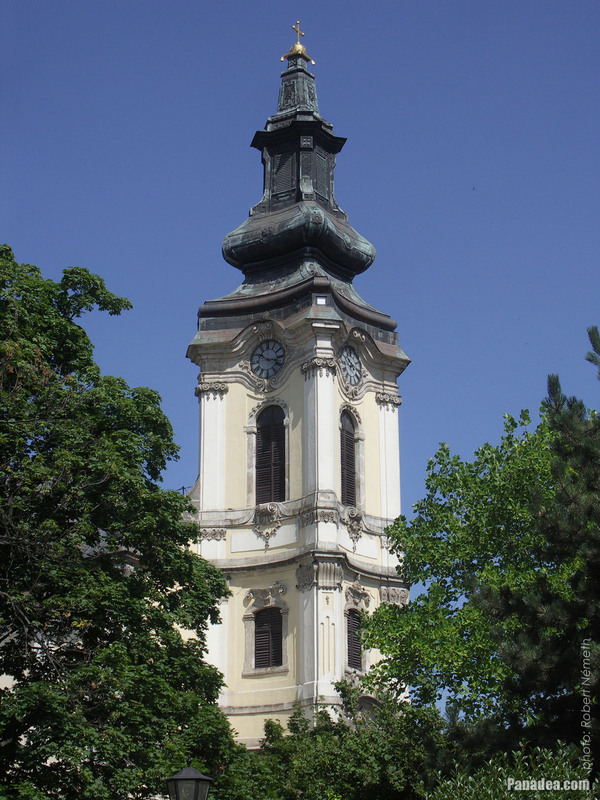 So the tower burned down and it was restored only between 1968-1969, thanks to the intercede of András Sáros art teacher (at that time it could be especially difficult due to the communist state apparatus). 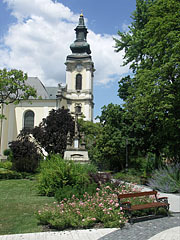 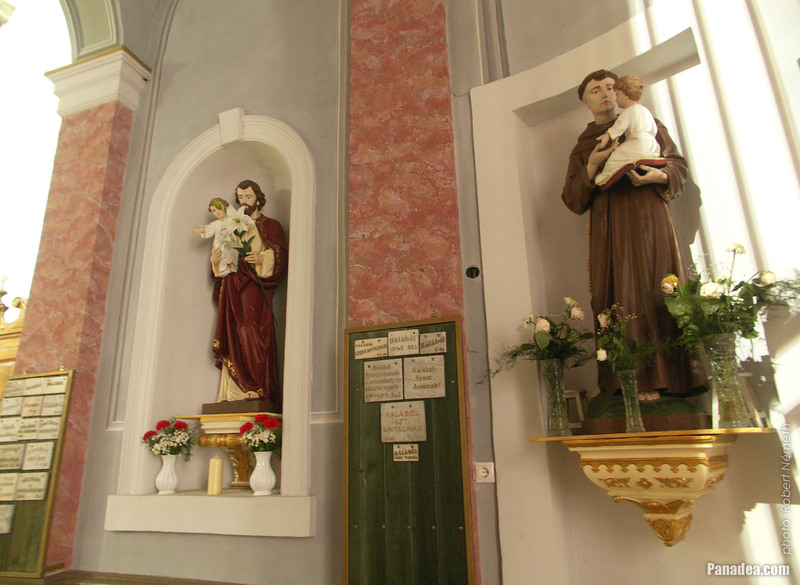 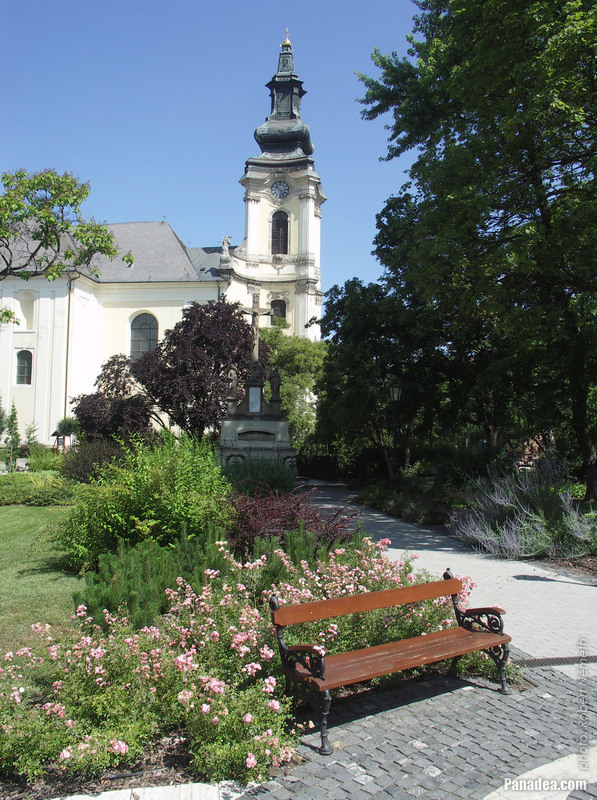 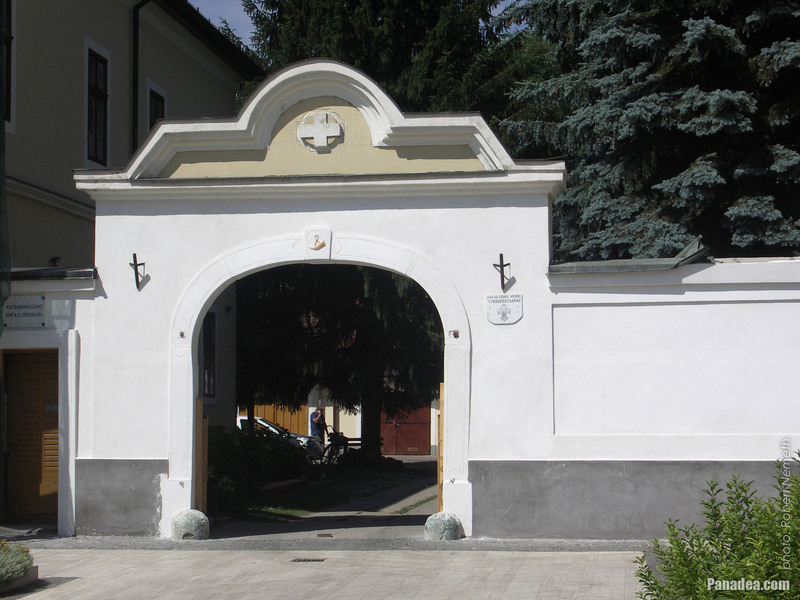 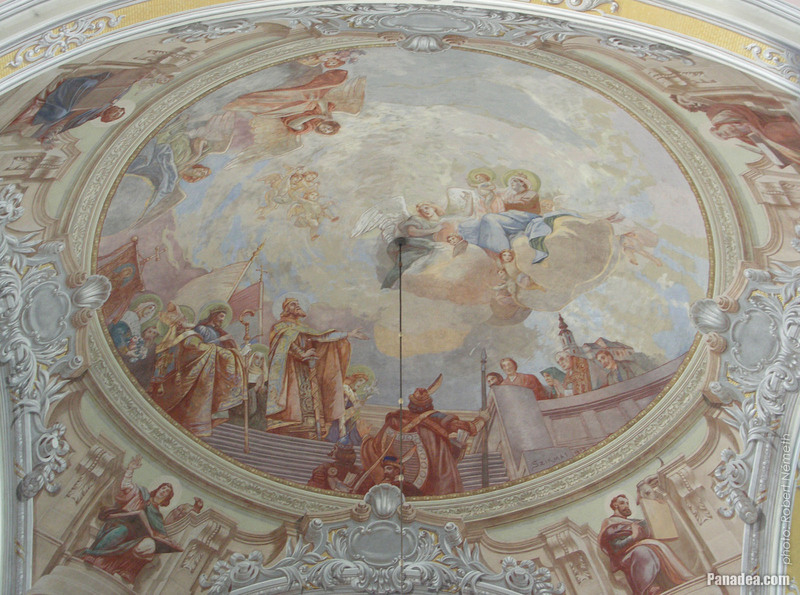 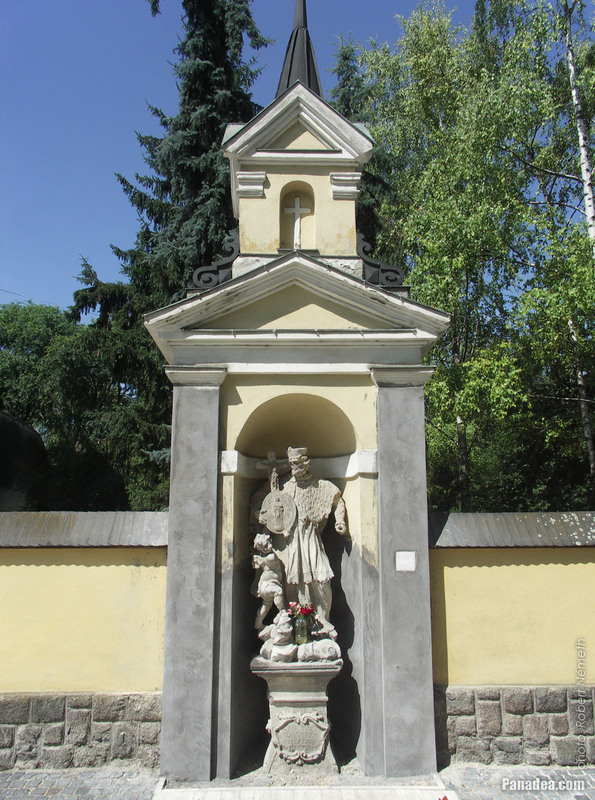 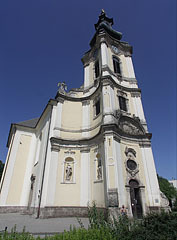 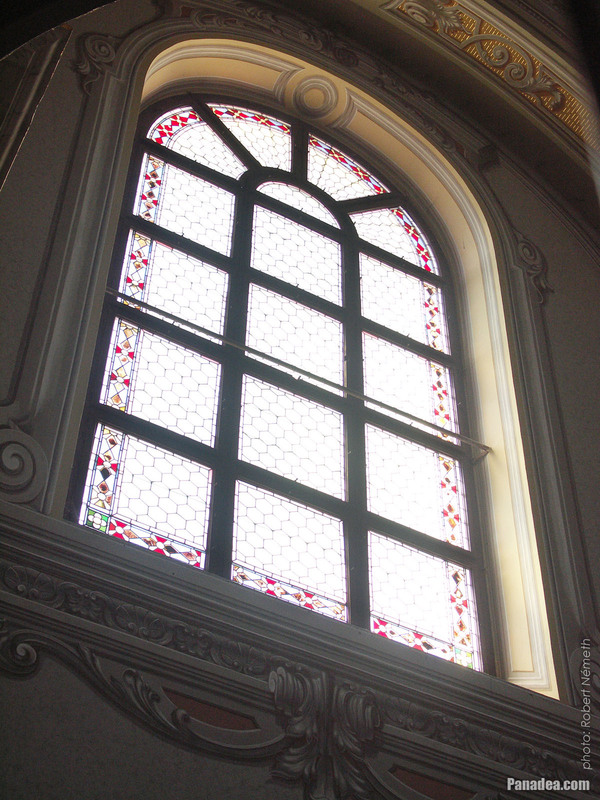 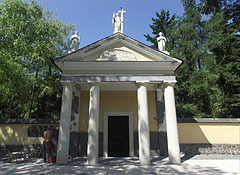 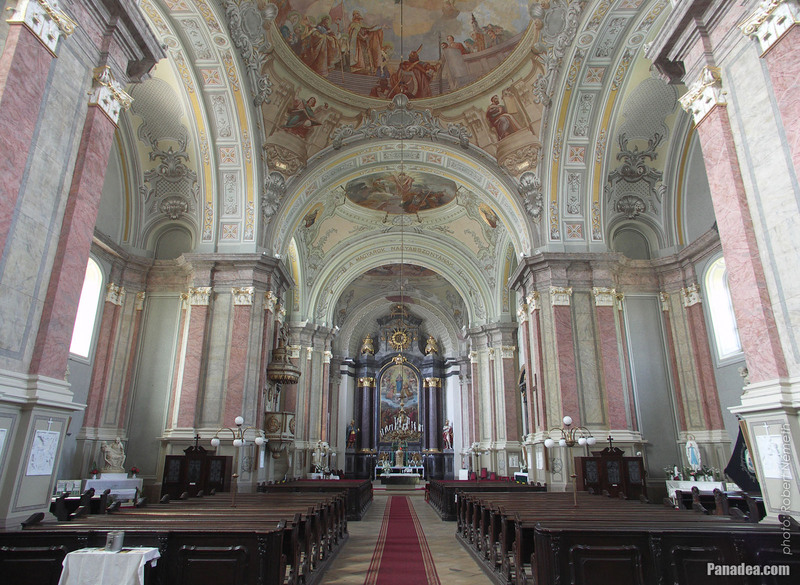 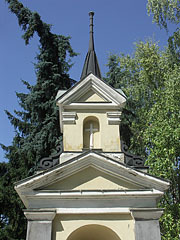 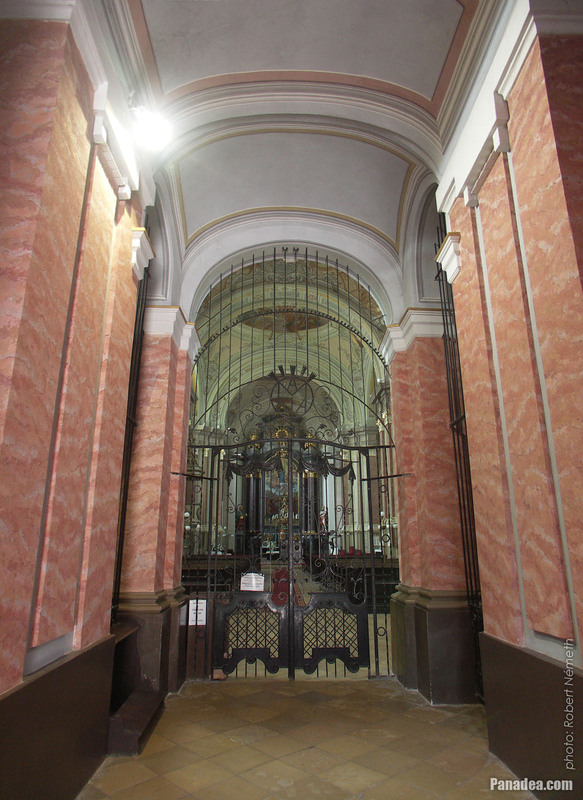 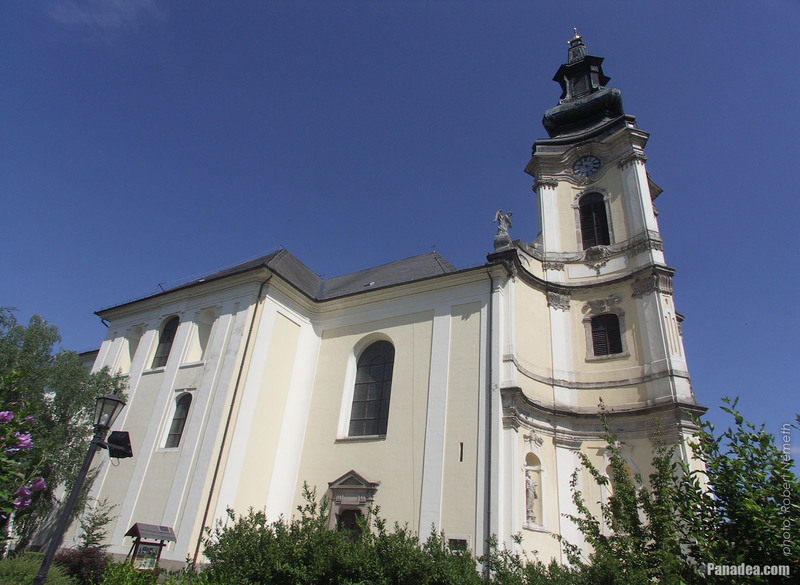 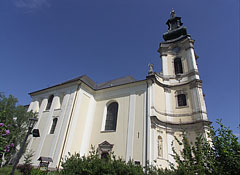 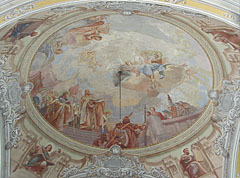 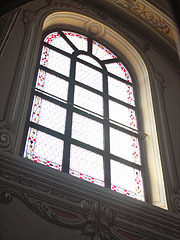 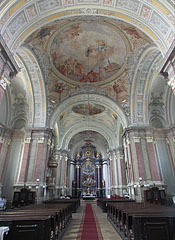 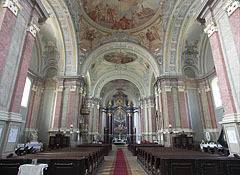 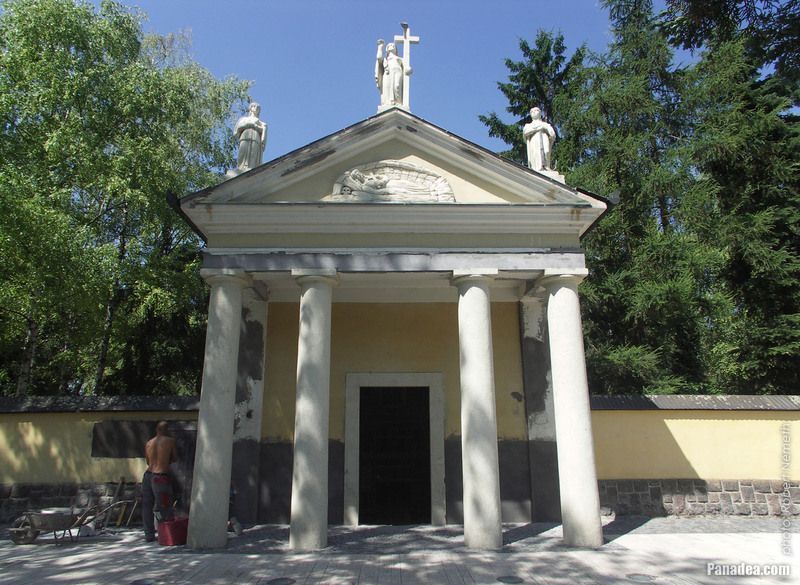 The original so-called St. Rosalia Chapel was built in 1713 on the main square of Jászberény, and according to the habits of those times in gratitude that the town escaped the plague. 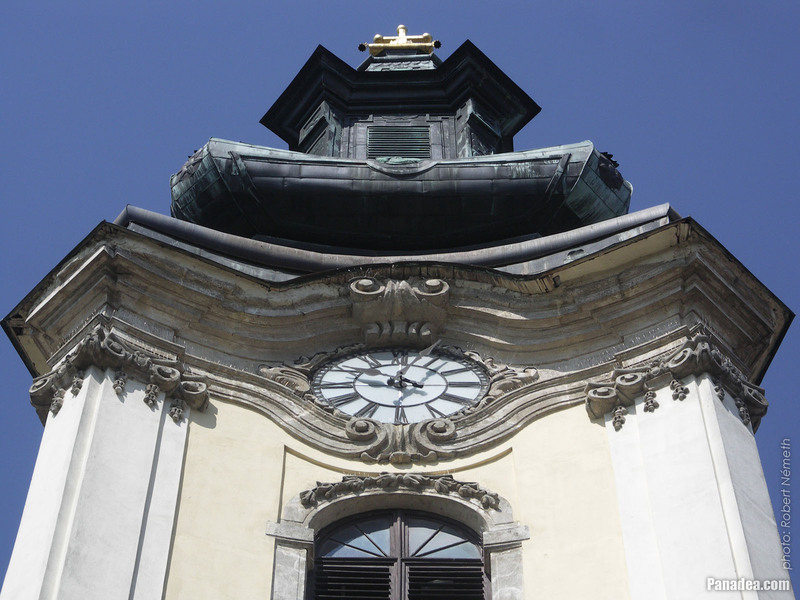 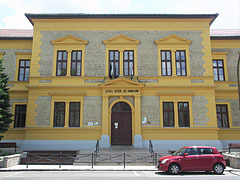 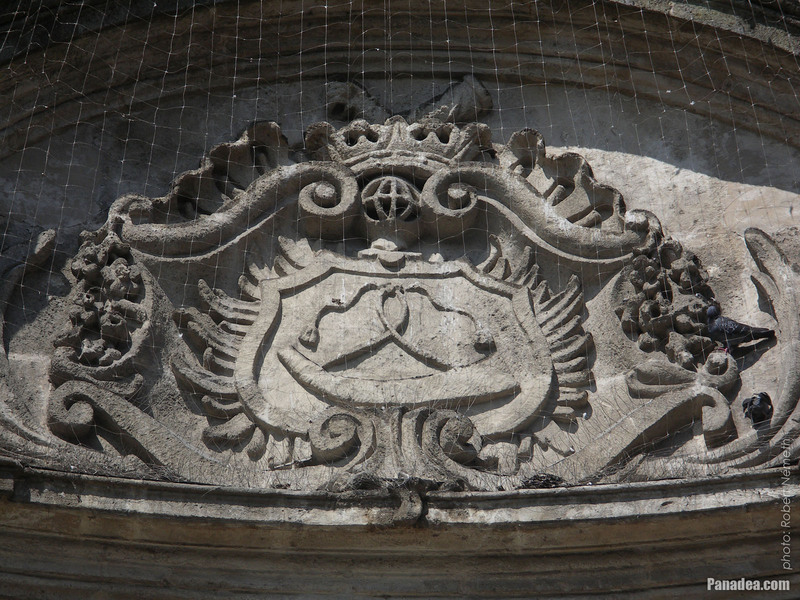 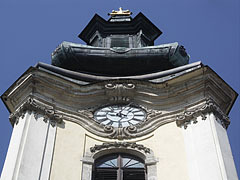 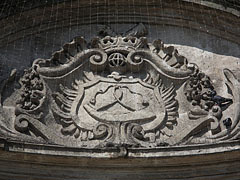 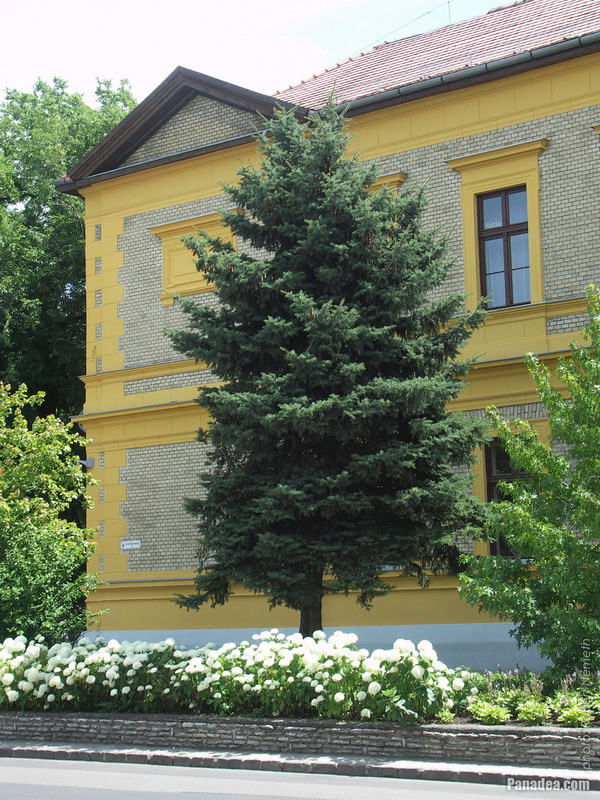 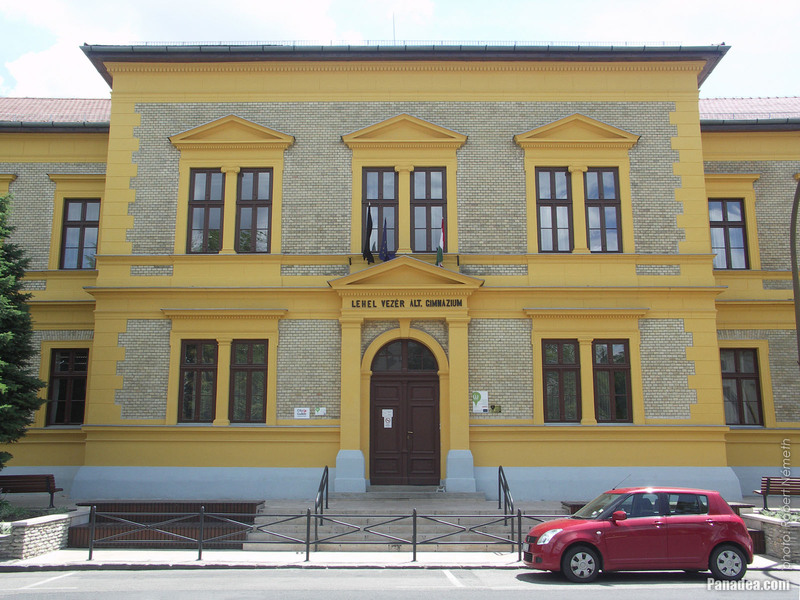 The current neo-classical style version with the triangular tympanum was designed by Ádám Haág and built in 1840. 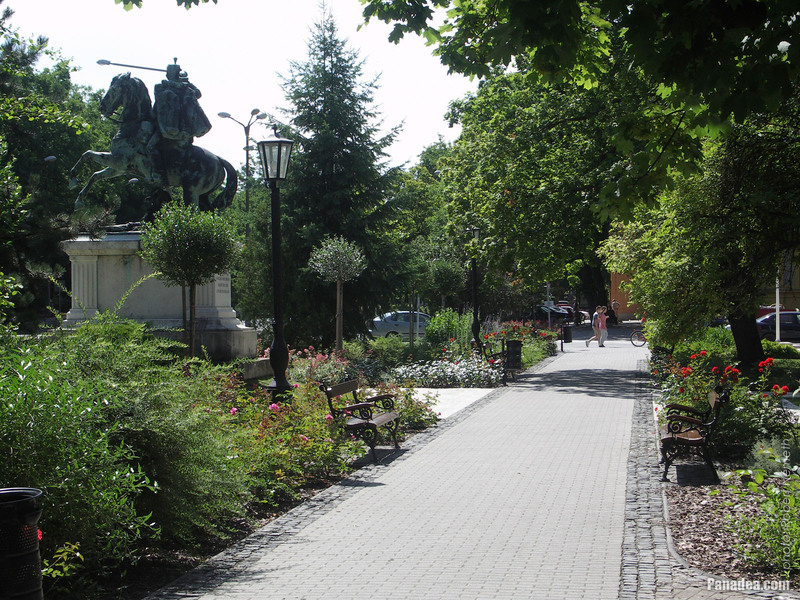 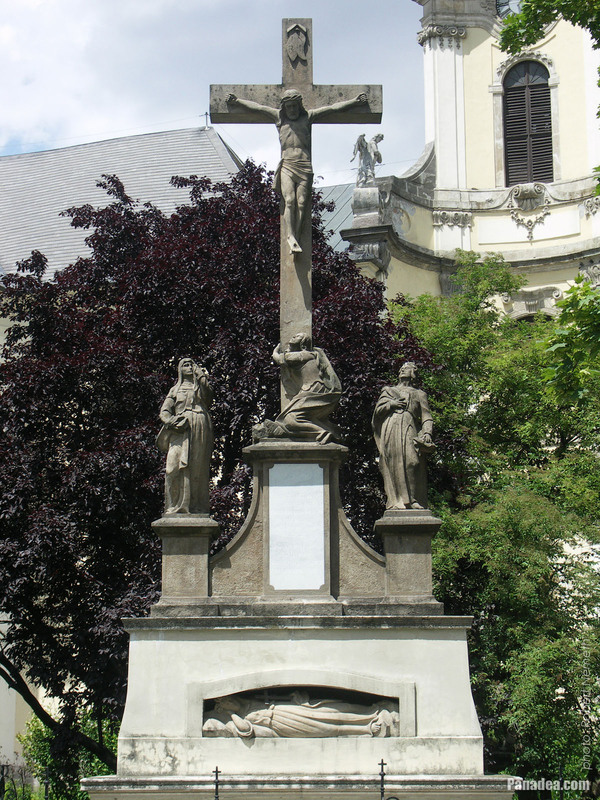 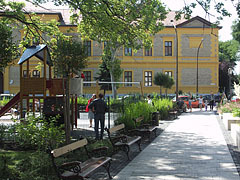 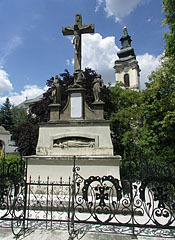 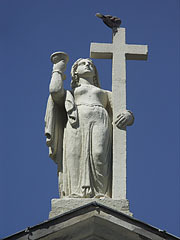 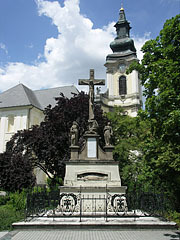 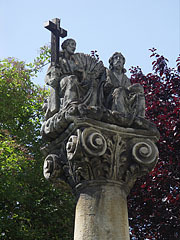 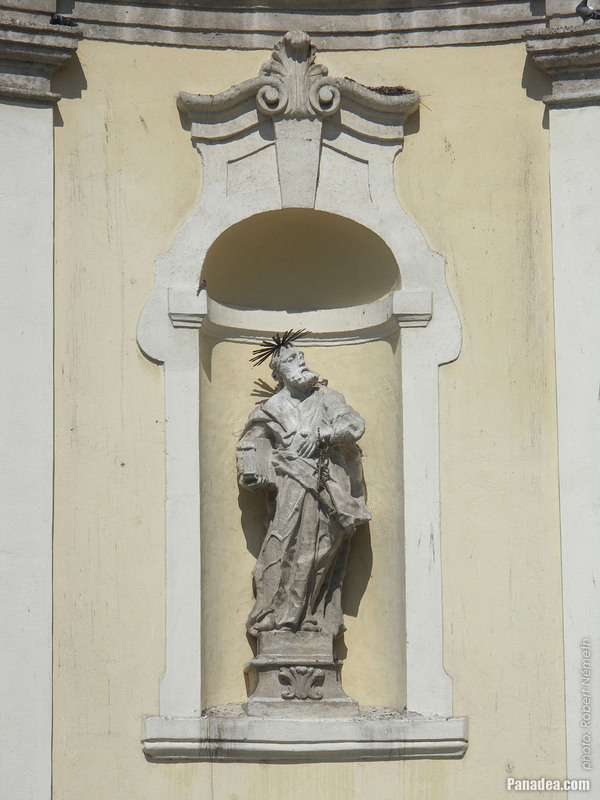 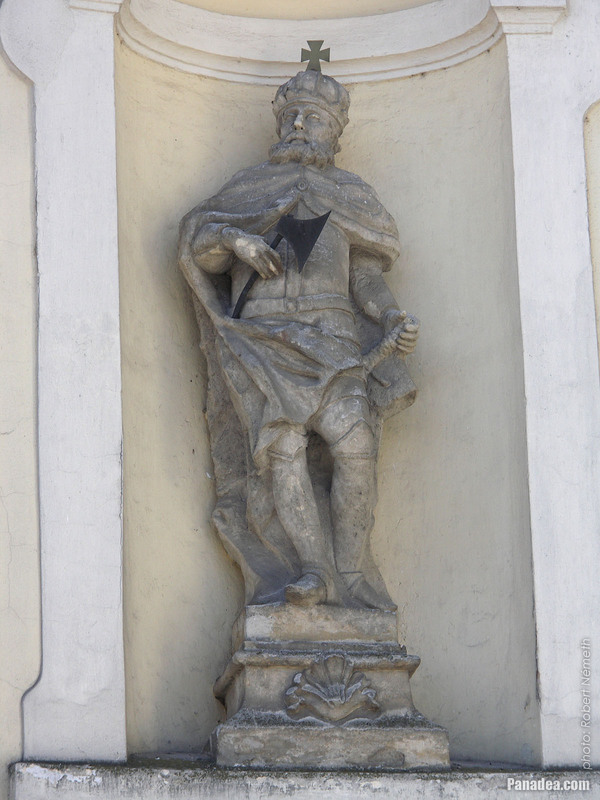 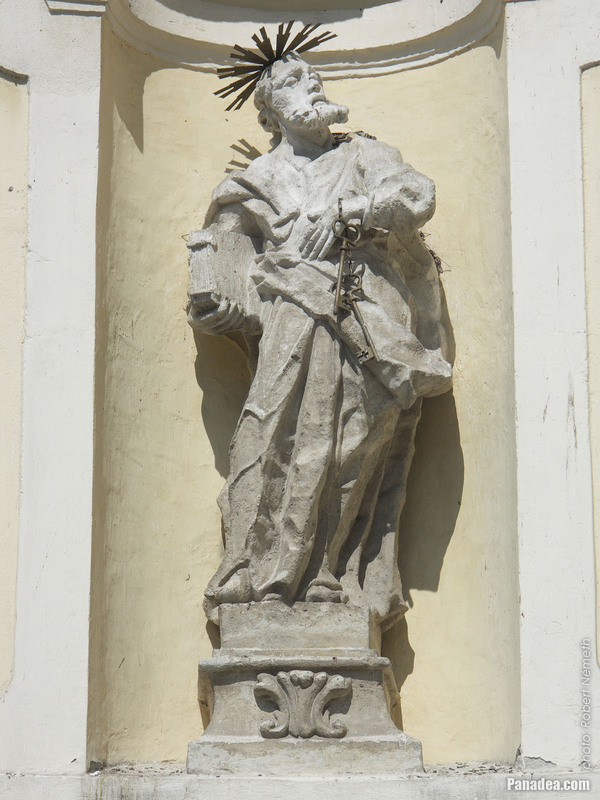 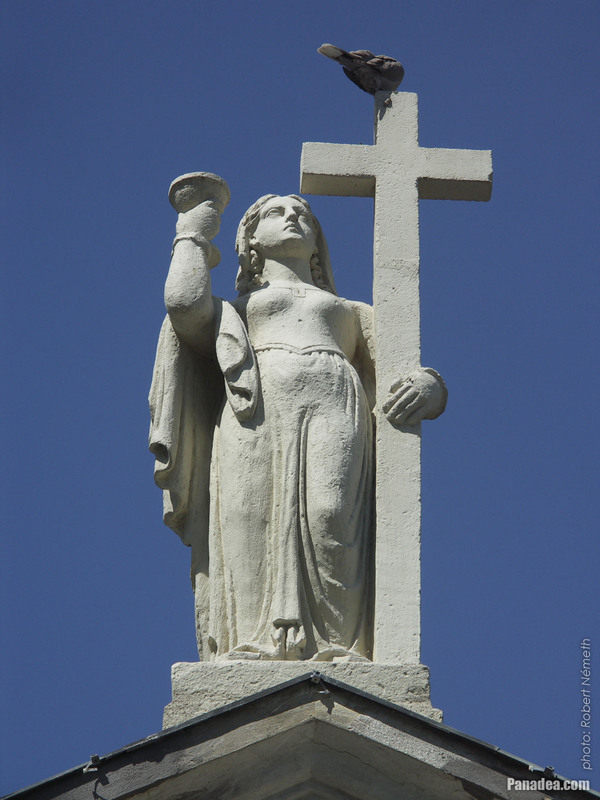 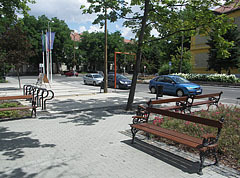 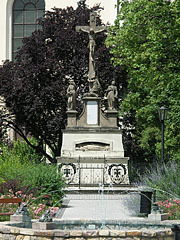 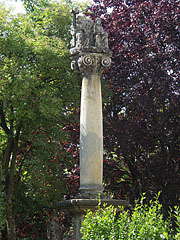 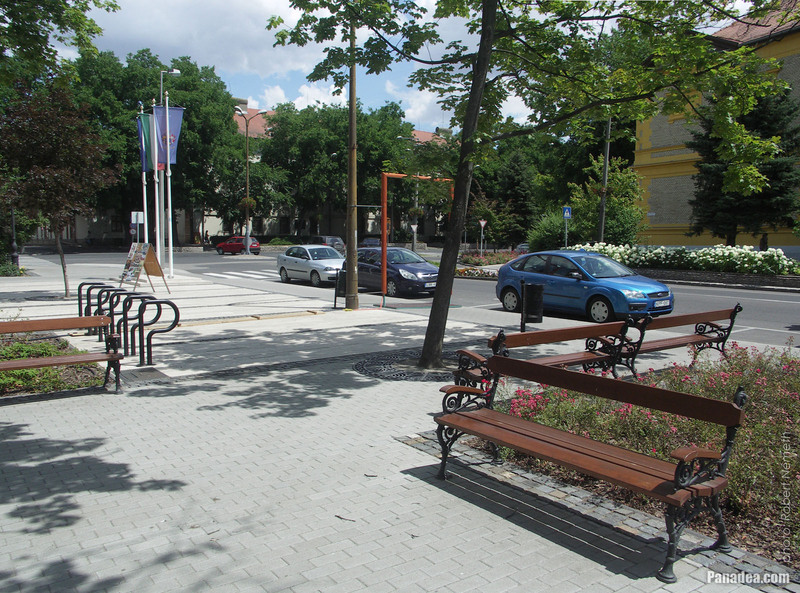 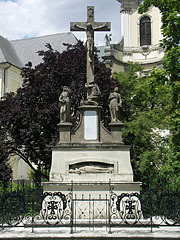 The alternate name of the baroque Calvary sculpture in the main square of Jászberény is "Pálinka Cross" (crucifix). 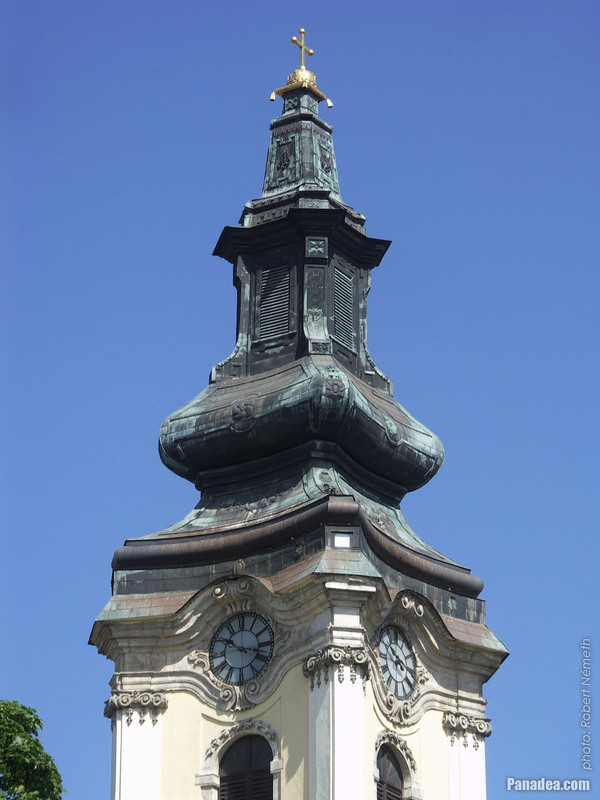 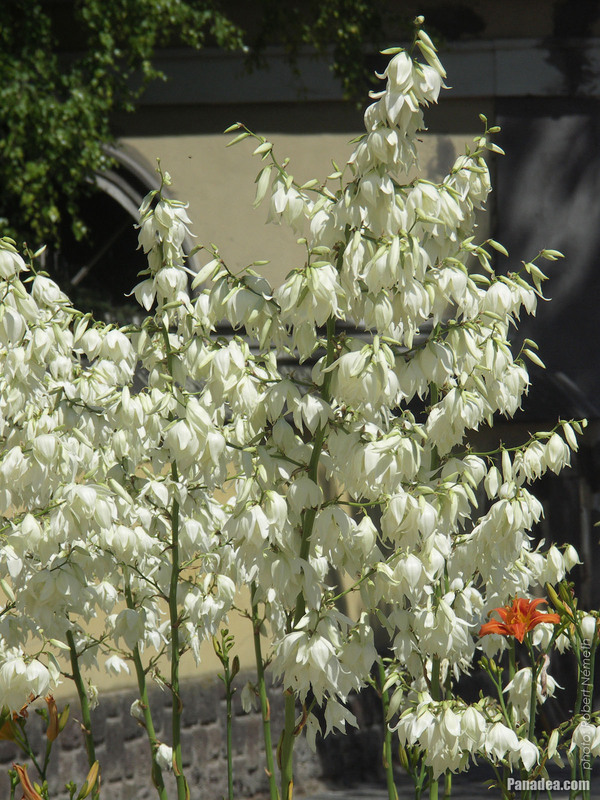 When there's a market here the pálinka (strong alcoholic drink, distilled beverage like e.g. 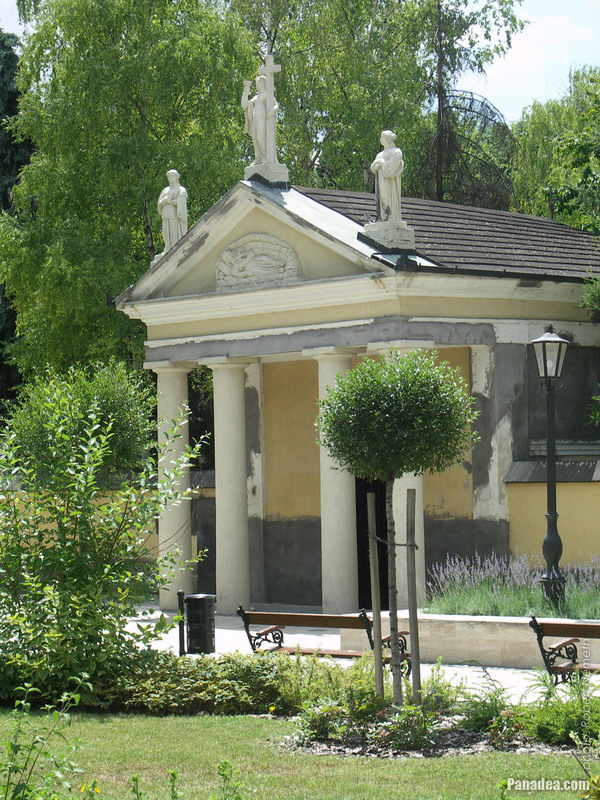 the brandy) was sold at the statue, so that's how this name has stuck to it. 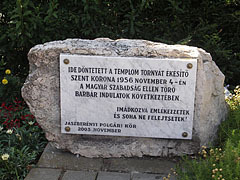 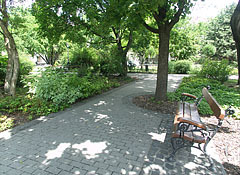 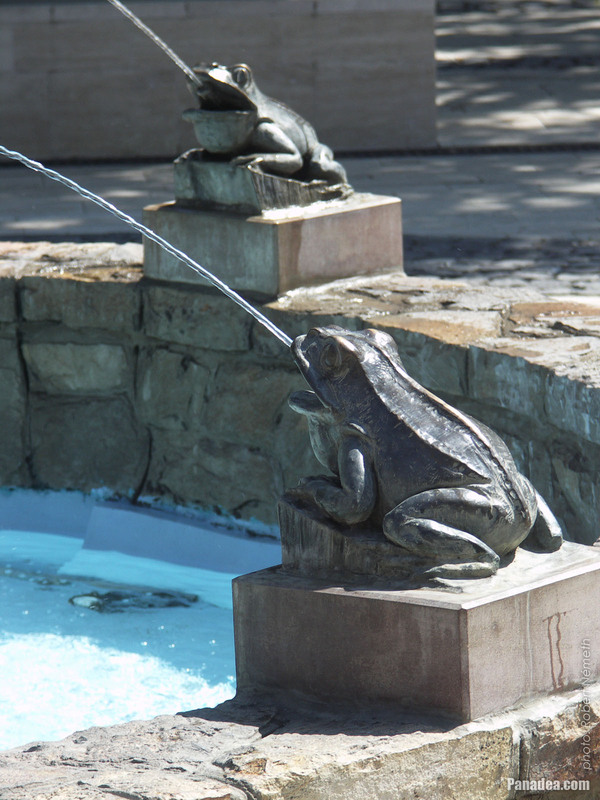 However, the sculpture didn't stand exactly on this site, it was placed here only in 1960. 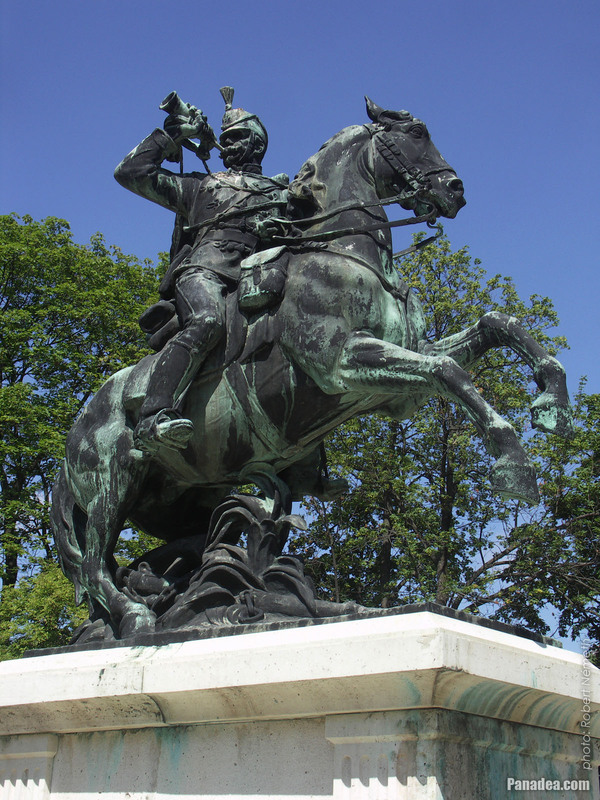 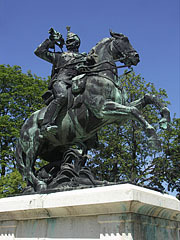 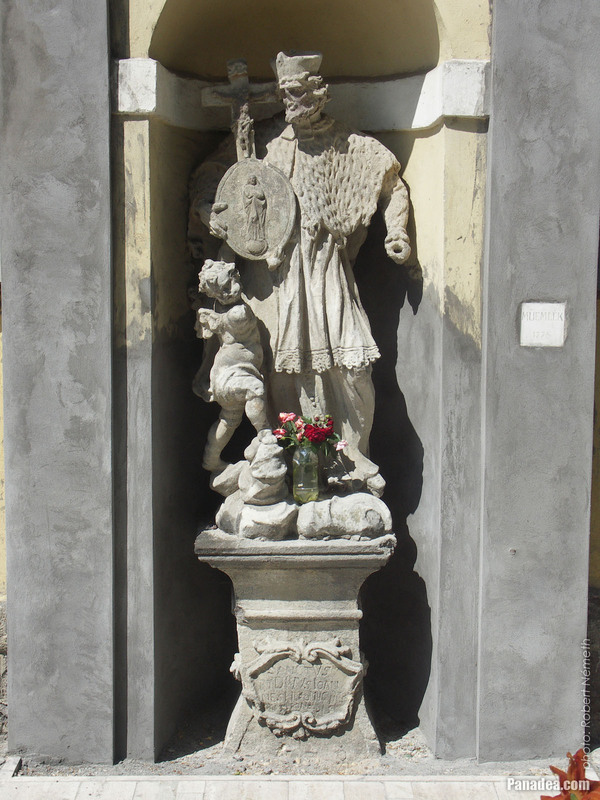 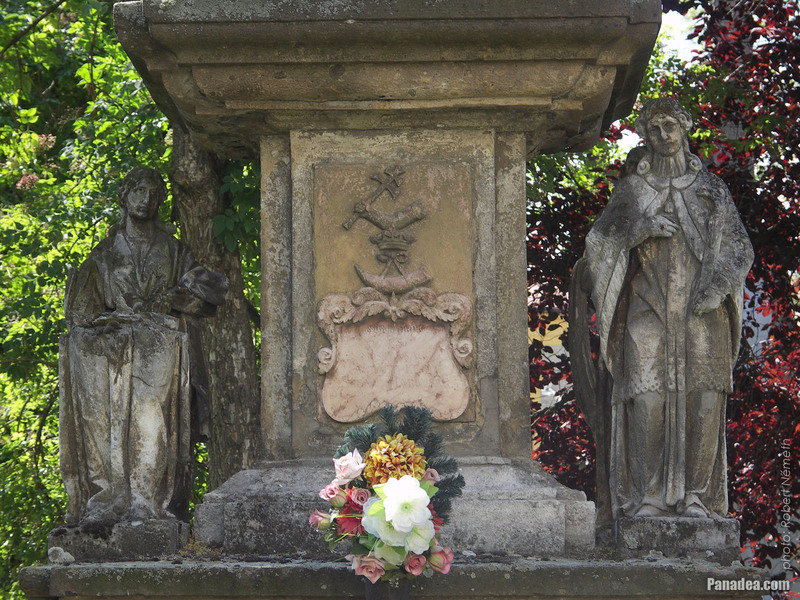 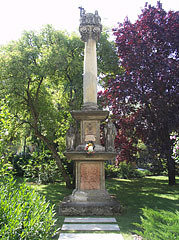 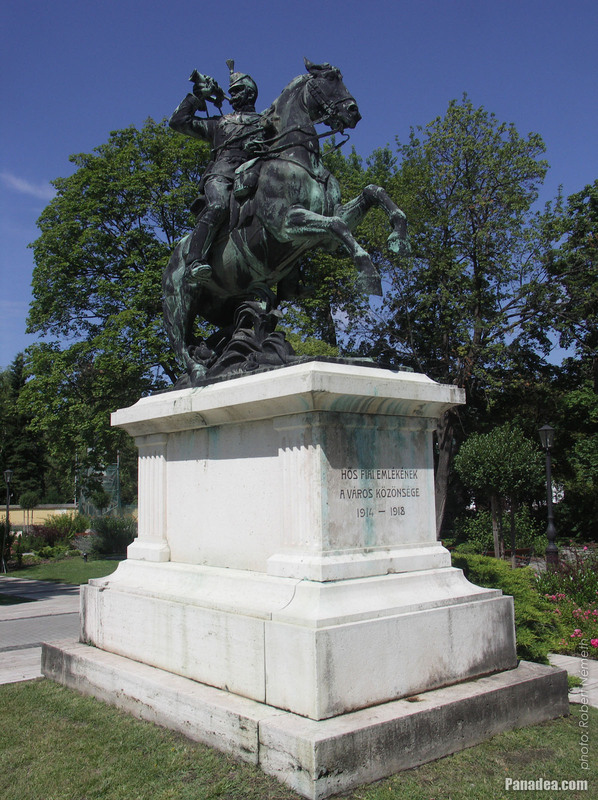 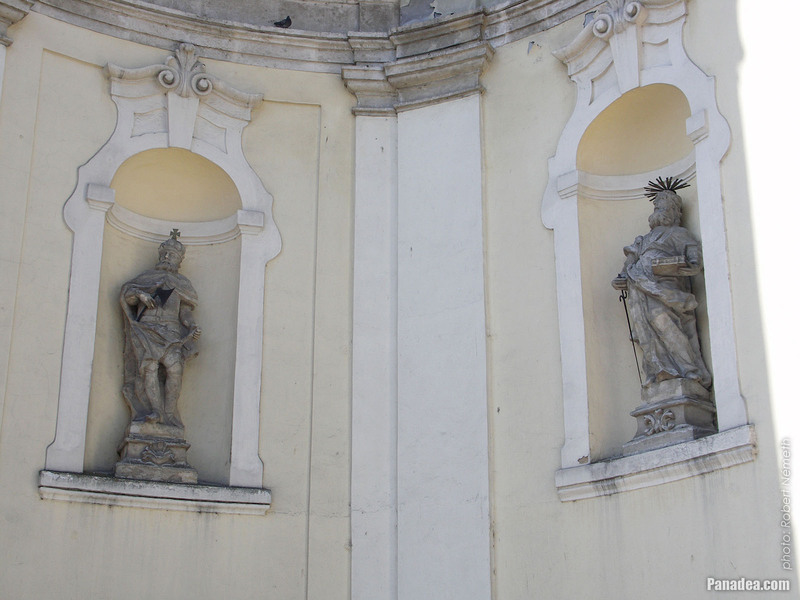 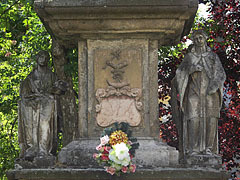 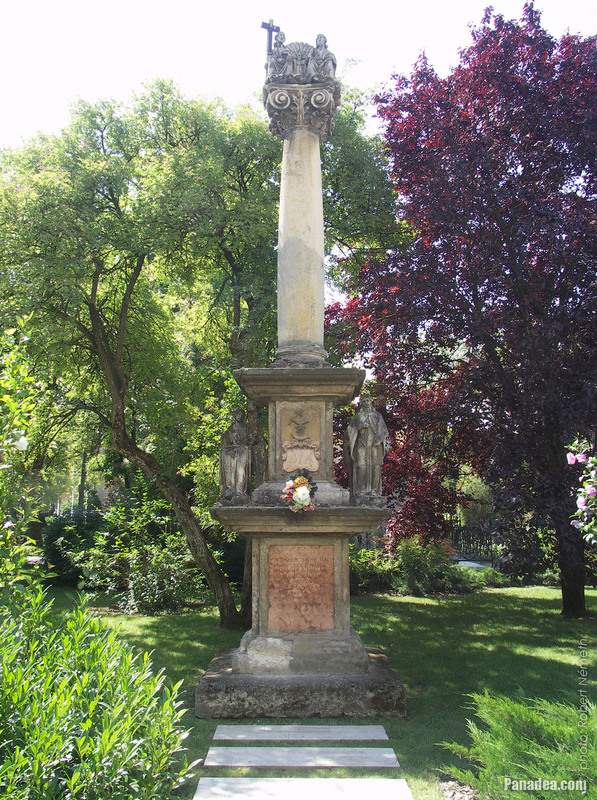 The baroque Calvary or Golgtha statue group was erected in 1752 by Judit Bálint, János Boleman's widow. 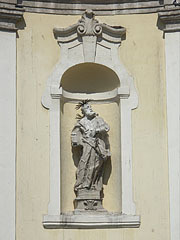 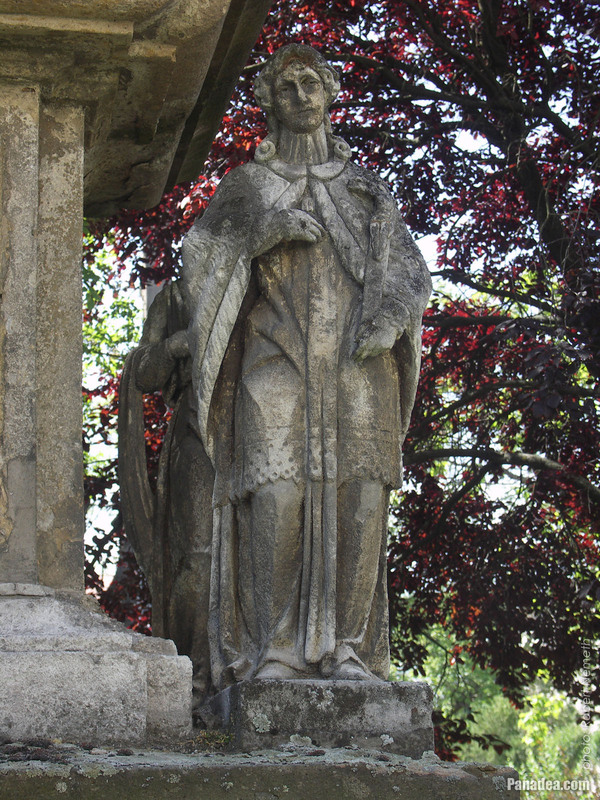 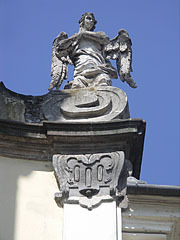 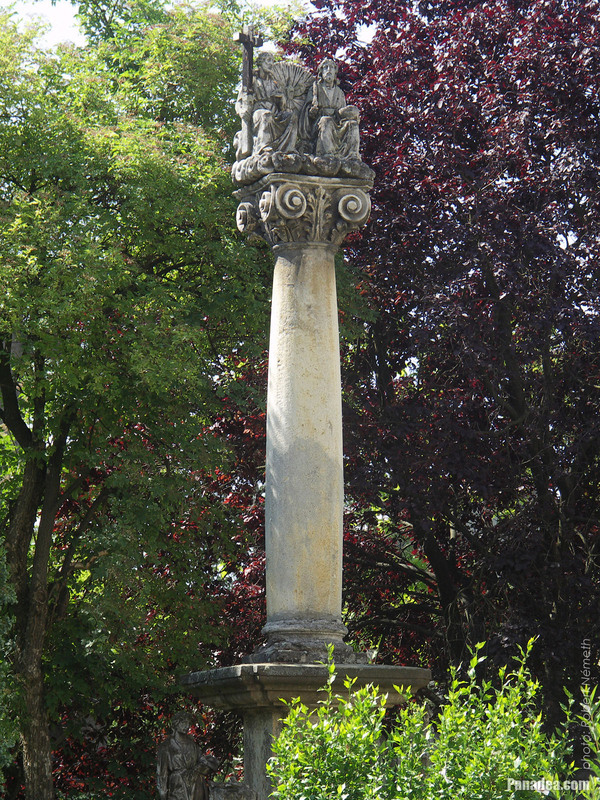 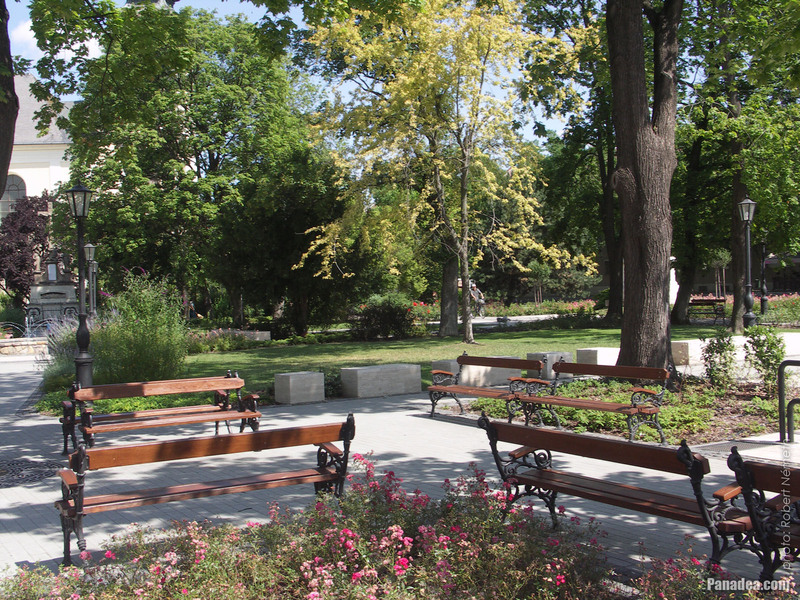 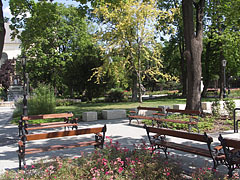 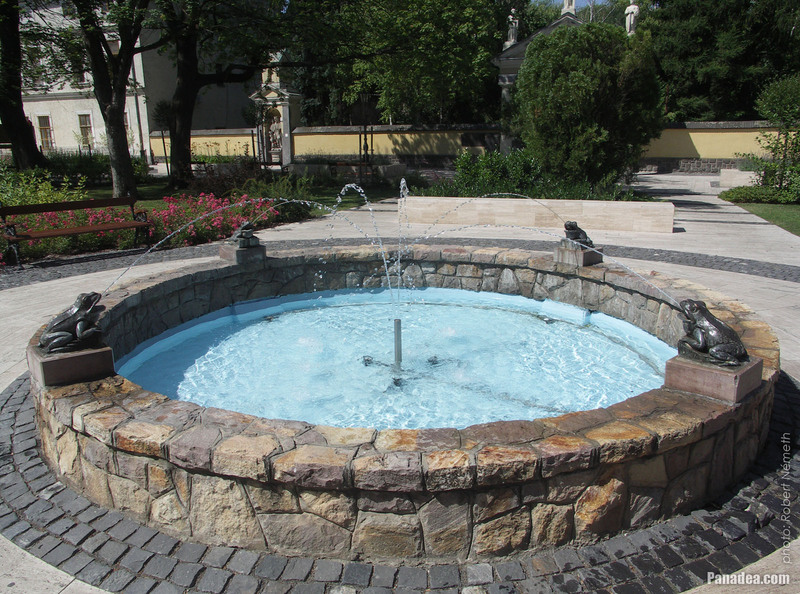 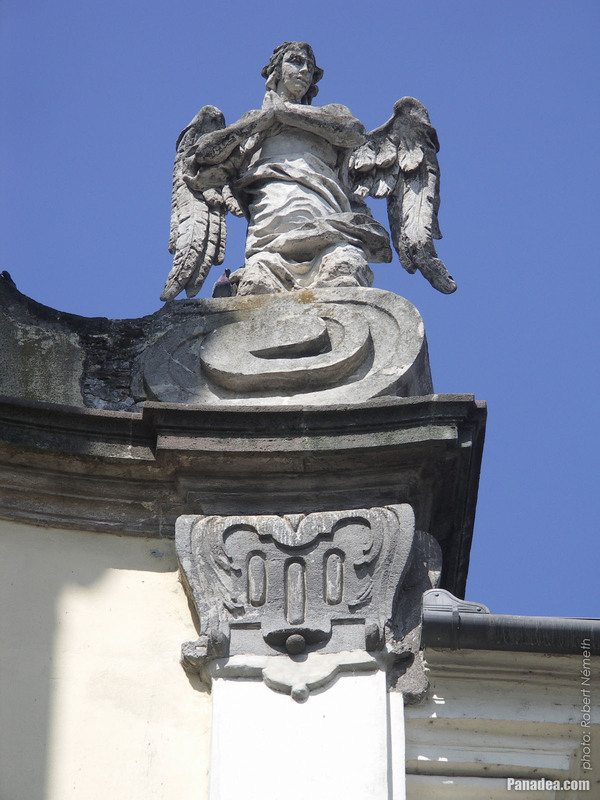 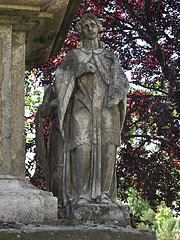 It was re-sculpted two times, firstly in 1905 by architect Henrik Kotál, then in 1943 by József Csák.